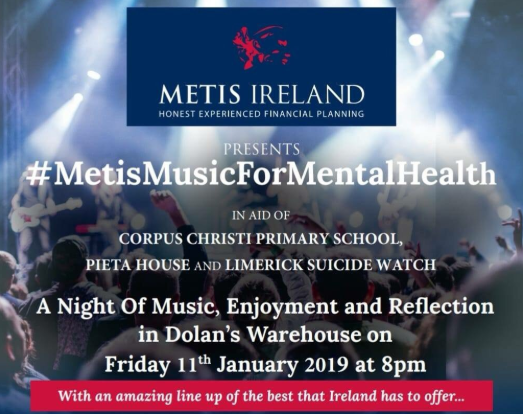 Recently in Dolans musical acts from all over took to the stage to take part in a fundraising concert and also to spread the word about mental health. It was a terrific night of music with some special guests both on stage and by video as well. It was all for three terrific organisations and now in its second year, the event has already become a must attend. The night kicked off with the fantastic Corpus Christi Choir who wowed the audience with their songs. They also did a poignant tribute to Dolores O Riordan as well. Throughout the night acts such as Dora Gola, Dylan Murphy, Siomha Brock and the Stray Saints played a terrific range of songs that showcased just how diverse and talented the music scene is. Towards the end of the night Emma Langford, Conor Ward and David Hope performed alongside the Shannon Gospel Choir before the night was brought to a close with all the acts coming back out on stage to a rousing reception. Limerick Suicide Watch who as we know keep an on the river Shannon, and who identify and provide support to those in distress and who may be contemplating suicide. Pieta House who provide a free, therapeutic approach to people who are in suicidal distress as well as those who engage in self-harm. Corpus Christi Primary School who aim to positively shape all their children’s futures. There were some special guests on the night both on the stage and on the screen as well. Jon Kenny performed live on stage for the first time in 5 years and got a terrific reception from the crowd. Throughout the night many special guests contributed by video including John Kiely, Vicky Phelan, Niamh Briggs and Brian Cody to name but a few. These just added to the overall atmosphere and showed just how important a cause mental health is to a wide range of people throughout the country. Mental health is such an important topic of discussion at the moment and if nights like this can help people discuss it more and help those who have struggled then it should definitely be welcomed. All of us here at ICHAS would like to congratulate everyone involved on the night. It was special for all who attended. Roll on #MetisMusicForMentalHealth 2020! !